Tax revenue as a percent of GDP is one metric many use to gauge how much corporate income tax revenue the United States is raising. The advantage of this metric is that it controls for the size of the economy and gives people a readily available way to compare the United States to other countries. When we look at this metric, the United States has low collections compared to other industrialized nations. The corporate tax raised revenue equal to 2 percent of GDP compared to the OECD average of 3 percent in 2011. It was the opposite in 1979, when we collected more than other industrialized countries as a percent of GDP (2.8 percent versus 2.2 percent). This has led to the claim that U.S. businesses are increasingly using deductions, credits, and other techniques to lower their tax burden compared to their counterparts in other countries. Whether or not it is the case that tax loopholes and planning caused this, there is a fundamental issue to keep in mind when using corporate tax revenue as a percent of GDP data. This data is missing a large chunk of business tax revenue that is taxed through the individual income tax code. 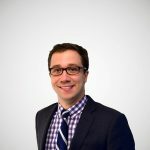 More than 50 percent of business income in the United States is earned by non-corporate business entities called “pass-throughs.” These pass-through businesses, such as LLCs, S-Corporations, and Sole Proprietorships are taxed through the individual income tax, not the corporate tax code. As corporate tax revenue has declined as a percent of GDP, the amount of business income earned by non-corporate businesses has increased. 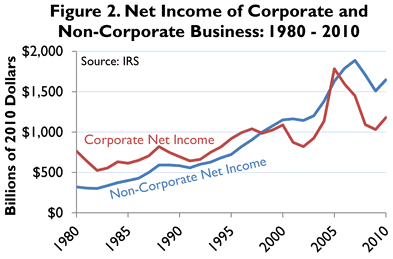 From 1980 to 2012 non-corporate net income grew from $360 billion to $1.6 trillion; an increase of 400 percent. Meanwhile, corporate net income grew slower from about $763 billion to $1.7 trillion, or an increase of 100 percent. There has been a three-decade-long move towards businesses operating as pass-through businesses rather than traditional C-corporations in the United States. Now, pass-through businesses account for more business income than traditional C-corporation income. This means that when we look at corporate tax revenue as a percent of GDP, we are understating the amount of tax revenue the U.S. collects from businesses as a whole. In other words, it is correct to state that corporate revenue as a share of GDP is low, but one of the reasons is that a lot of business income is being taxed under the individual code.